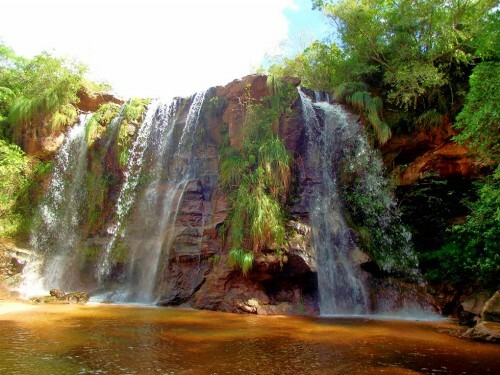 Visit Cuevas and its Gorgeous Waterfalls near Samaipata, Santa Cruz, Bolivia. ESPAÑOL Cuevas is a beautiful area very near to Samaipata just 2 hours by road from the city of Santa Cruz. As you leave the city heading straight West the landscape becomes hilly and the weather cooler as you head into the sierras (foothills... which is why the city is called Santa Cruz de la Sierra). The drive to Samaipata is absolutely one of the prettiest drives in the area. As you near the town of Samaipata (known in Bolivia as "Little Switzerland" because of its privileged mountain and valley views), you'll first pass through Cuevas (which means "the caves"). Here you can stop to rest and hike into the forest to view a series of three waterfalls. There is a parking and picnic area at Cuevas and it's a popular stop. Just prior to arriving in Samaipata (9 kilometers before arriving), you'll find to your left a road that leads up to El Fuerte de Samaipata (the Samaipata Fort), which is the largest carved rock in the world. At El Fuerte de Samaipata you'll see the ruins of an ancient indigenous town and ceremonial center. The enormous rock is thought by some to have been an ancient sacrificial temple. Others go so far as to say it was a UFO landing site. The small town of Samaipata is a popular site for tourism in the department of Santa Cruz. Many locals own weekend homes there and there are plenty of cabins and homes for rent as well as several hotels and restaurants. Quite a few foreign families have made this a year-round home.